Eagle Island Camp at Xaxaba is a luxury tented camp situated on an island in the Central Delta. 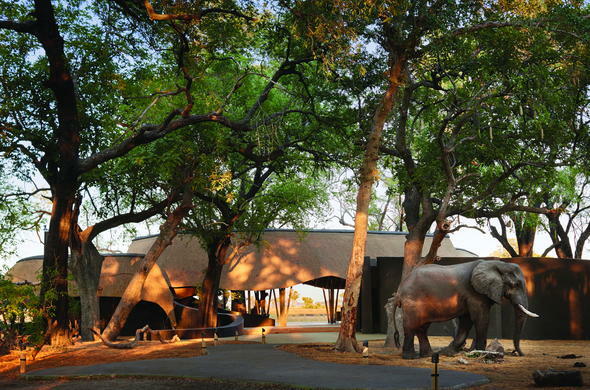 Shaded by a canopy of indigenous trees, it offers a cool retreat from the African sun. Xaxaba (pronounced 'Ka Kaa ba') is one of the Delta's most pristine natural locations, a region of myriad waterways, palm-treed islands and vast flood plains. Bird and animal life in this African safari region is prolific. Eagle Island Camp offers game viewing by mokoro (traditional dugout canoe), motorised boats and a 14-seater sundowner cruiser. For intrepid explorers with an appetite for sights and sounds of the bush, Eagle Island offers guided walks. The magnificent sunsets can be enjoyed during times of high flood from the camp's Fish Eagle Bar or from the raised deck overlooking the lagoon. Even though the Okavango Delta is technically known as a swamp, the water is remarkably clear and free of impurities. It is also heavily stocked with fish. So it will come as no surprise that Eagle Island boasts the highest concentration of magnificent Fish Eagles on earth. The plethora of food availability attracts every variety of bird with a hearty appetite for fish, including Heron, Cormorant, Pelican, Darter and Stork. The water of the okavango delta is heavily stocked with fish. So it will come as no surprise that Eagle Island boasts the highest concentration of magnificent Fish Eagles on earth.